This Compact explorer yacht is now available for charter! VivieRae II has mega-yacht styling, luxury and the capability to travel the world, all within a manageable 30 meters. 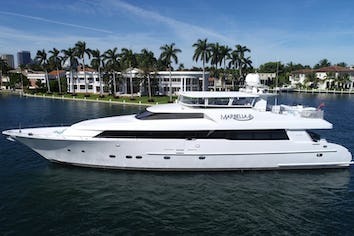 She boasts a luxurious interior, and functional yet relaxing exterior spaces, that mimics those of mega-yachts for the highest level of comfort imaginable, no matter how remote the itinerary. VivieRae II has a big skylounge aft of the pilothouse outfitted with pull-out sofa which can double as the 5th cabin, desk, and 65” television enabling multi-purpose uses for lounging, working or a bonus sleeping quarters. Electric sliding doors open up to the skylounge deck featuring a bar, bar stools, drinks fridge, BBQ, and of course, a spectacular view – everything you need for entertaining. 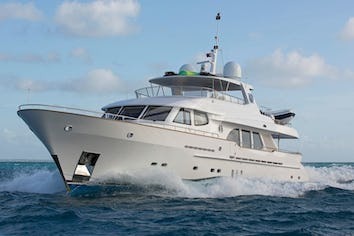 VivieRae II has been fitted with a large hardtop Bimini, offering shade to guests relaxing on the superyacht sundeck. Other key features include a shaded aft cockpit and a smart grey hull finish. VivieRae II brings a source of pure enjoyment, a place to get away from the rigors of everyday life, a haven in which to spend time with the people you love most. Terrific vacation. We have been on many charters and this was the best yet! Great Yacht. Top, top notch crew! Courteous, attentive, knowledgeable are all adjectives that apply describing the Captain and crew. Jay was safety-conscious, made us aware of options on a daily basis, thoroughly investigated our alternatives, and planned based on our wishes. Ben and Jon took us on a number of adventures and were great hosts, from a beach picnic to water skiing, kayaking, snorkeling, ATV rides, and more. Very enjoyable hosts. And Lauren was thoroughly delightful. A bunch of “foodies” were on this trip and Maxine exceeded all our culinary expectations. Yacht was kept in immaculate condition the entire trip, and it’s a beautiful boat, top to bottom. Captain Jay presented us with our alternatives for each day and we set the pace and activities we wanted. For the time of year we were on the yacht (late Dec. to early Jan.) the pacific side of Panama was amazing! San Jose Island in particular. 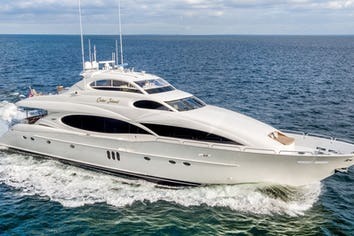 Would definitely charter this yacht again. Wonderful yacht. Absolutely outstanding crew. Please let he owner know how very pleased we were with his outstanding crew (our best yet) and beautiful boat.